A recent survey from PNC Bank found that many Baby Boomers are anxious about retirement, particularly when it comes to health care costs, their level of savings, and the issue of longevity. 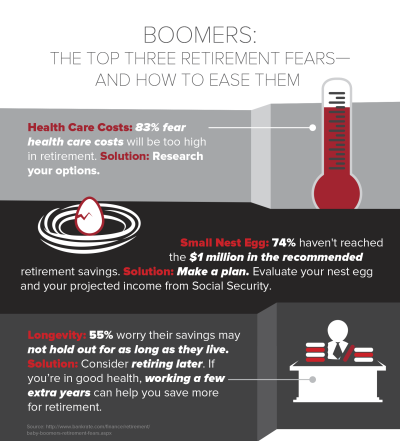 Neary 83 percent of Baby Boomers are afraid their health care costs will be too high in retirement. While most retirees will have medical insurance in the form of Medicare, there’s no cap on total out-of-pocket expenses, and those dollars can add up. A recent report found that a healthy 65-year-old couple will need more than $260,000 to cover additional health care costs over the course of retirement—and that’s only basic coverage. Factor in dental and vision coverage as well as other expenses, and the cost rises to nearly $400,000. Neither of those estimates includes long-term care. Solution: Research your insurance options. You can limit out-of-pocket costs with a Medigap policy, additional insurance coverage purchased through a private company to help pay for expenses not covered by Medicare. Other insurance products might be able to help with costs associated with long-term care or other ailments. Nearly three-quarters (74 percent) of boomers haven’t reached $1 million in retirement savings, though most have estimated that they’ll need at least $1.3 million to retire comfortably. Additionally, a recent report found that, while most Americans have a goal retirement income of about $45,000 a year. Unfortunately, the average nest egg holds just $136,200, which would produce an income of just over $9,000 a year. Solution: Make a plan. Evaluate your nest egg and your projected income from Social Security. If necessary, start boosting savings now. Downsizing early—moving to a smaller home or a cheaper city and cutting back on expenses—can help you set aside more for retirement now and also prepare you to live on less in your post-working years. More than half of Baby Boomers are worried their savings won’t last for as long as they live. Americans are living longer than they used to, and the average 65-year-old male can expect to live until age 83. (For 65-year-old females, it’s 86.) Yet many will live even longer. Half of those age 65 and up can expect to live past the average, according to LIMRA, and nearly 25 percent will live into their 90s. That means some boomers could be retired for as long as 30 years. Solution: Consider retiring later. If you’re in good health, working a few extra years can help you save more for retirement and delay withdrawals from your nest egg. You could also switch to working part-time or find a new “encore” career that’s more enjoyable. While Baby Boomers’ retirement fears are completely justified, they can be overcome with proper planning and advice.